"Klösterreich" - that is more than a label of tourism advertising. Because it describes what the k. u. k. The Monarchy of the 17th and 18th centuries is so significant: the newly won self-confidence after the victory over the Turks and repression of Protestantism, the close coexistence of crown and church, which finds its expression in the Baroque. Art, religion and the feeling for life enter into an inseparable connection that releases unsuspected creative powers. Our journey to the churches and monasteries of Lower Austria, which mirror the spirit of the epoch, as elsewhere in Europe, is considered to be this "Gesamtkunstwerk". But we also enjoy the wine-savvy landscape of the Wachau and the Kamptal, experience a piece of baroque lifestyle at the "Heuriger" and accompany us on the way with music by Austrian baroque composers. A special emphasis is the encounter with the monastic life and the insight into the culture of the various orders. Our stand quarter, the guest house of Stift Göttweig, one of the most important monasteries in Europe, offers the best conditions for this. Flight to Vienna or Munich. Transfer to the Benedictine Abbey Göttweig: hotel accommodation for eight nights. The first goal of this day is the Parish and Pilgrimage Church of Our Lady of Sorrows in Dreieichen, a uniform late baroque building with a light interior, for which Paul Troger created one of his last works. We continue to the Premonstratensian chapel of Geras, which was given its present form in the late Baroque by Jakob Munggenast - the Church of the Nativity of the Virgin Mary as a Baroque robe of a Romanesque pillar basilica, the convent buildings with spirited pavilion construction, festivals and magnificent marble hall. With the Benedictine Abbey of Altenburg Josef Munggenast has the main work of the Danube Baroque in the 2nd quarter of the 18th Jhs. created: the church as a large oval dome space (with frescoes by Paul Troger and others), the pen buildings with imperial rooms and especially the magnificent library, a perfect combination of architecture, painting and sculpture, of space and color. Special attention should also be paid to the gardens of the monastery, which invite you to linger and be amazed: the "Garden of Religions", the "Garden of Creation" and the "Garden of Silence". The morning belongs to Stift Göttweig. Possibility for worship service. Round trip through the baroque monastery complex, planned by Lukas von Hildebrandt as a huge fortress of God and still in its realized form of impressive dimensions. Of course we can see the Collegiate Church of the Assumption of the Virgin Mary, but also the grand Emperor's staircase with ceiling fresco by Paul Troger, the Imperial Wing and the Prince's Room. 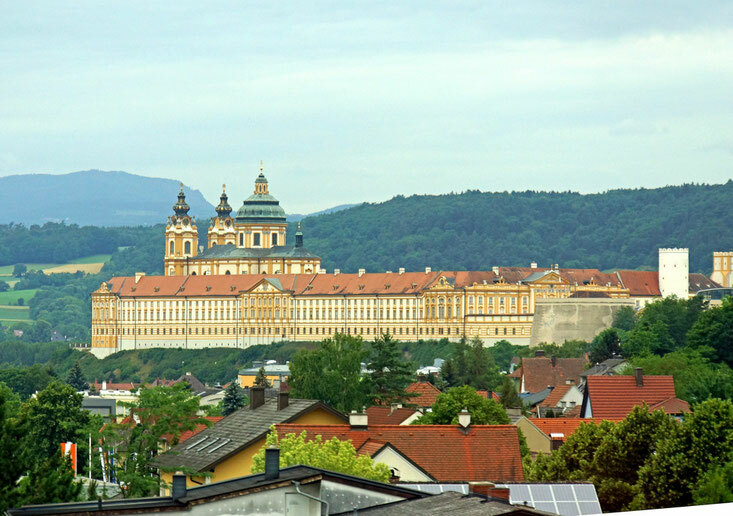 We spend the afternoon in the nearby wine village Krems, which is considered as the most beautiful town in Lower Austria with its beautifully preserved and lovingly restored old town. Day 8: From Romanesque to "Escorial"
Transfer to Airport. Flight back.